Adaptive Suspension Vehicle – FOP Shvachko V. V.
The Adaptive Suspension Vehicle (ASV) is a six-legged robotic system designed for sustained locomotion on unstructured terrain. The ASV project was initiated in January 1981 under the lead of Kenneth McGhee along with Robert Waldron at the Ohio State University (OSU), USA. The machine took its first steps in December 1985. The first outdoor tests of this vehicle were scheduled for the end of 1986. The Adaptive Suspension Vehicle carries an operator, who provides supervisory-level commands and, specifically, performs long-range sensing, path selection, and navigation. However, the mechanical and control technologies used are the same as those needed for unmanned operation, and an intensive effort to realize functions of an autonomous robot. The operator of the ASV interacts with the system via a joystick and a keypad. The operator receives information from the computer via two cathode-ray-tube (CRT) displays and a set of LED (light-emitting diode) bar gages. The ASV system senses 82 control variables, which are fed back to the control computer as analog signals. Six additional analog channels feed operator commands to the system via the joystick. A number of other analog channels monitor internal system status information. The ASV computer system consists of 17 Intel 86/30 single-board computers. The actuation system of the ASV is a two-stage hydraulic system. The mechanism used in the legs of the ASV is a two-dimensional pantograph. ASV has six operational modes: utility, precision footing, close maneuvering, follow-the-leader, terrain following, and cruise / dash. 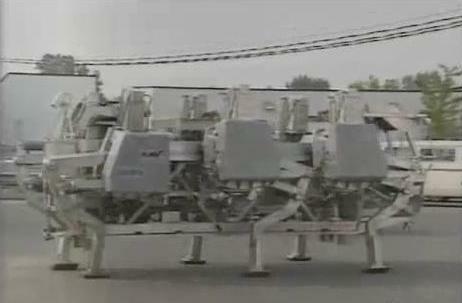 ASV was the first computer-coordinated legged system designed to operate in completely unstructured terrain. 1. Waldron K. The Adaptive Suspension Vehicle / Kenneth J. Waldron, Robert B. McGhee // IEEE Xplore – Control Systems Magazine, IEEE. – 1986. – N 6. – P. 7-12. 2. suspension adapted vehicle. – Mode of access: http://www.youtube.com/watch?v=EgT99XY5Ysc&feature=related. 3. OSU Adaptive Suspension Vehicle. – Mode of access: http://www.youtube.com/v/DIiD1JimBXQ. 4. Armada M. Climbing and Walking Robots. Proceedings of the 7th International Conference CLAWAR 2004 / Manuel Armada, Pablo Gonzalez de Santos. – Berlin Heidelberg: Springer-Verlag, 2005. – 1194 p.
5. Gonzalez-de-Santos P. Quadrupedal Locomotion. An Introduction to the Control of Four-legged Robots / Pablo Gonzalez-de-Santos, Elena Garcia, Joaquin Estremera. – London: Springer-Verlag, 2006. – 267 p.